I Have, Who Has games are a fun way to practice skills in the classroom. 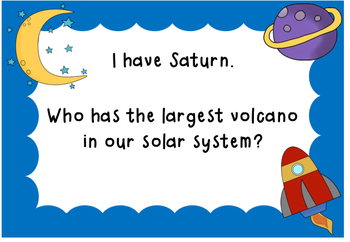 They are great for listening skills, curriculum review, just for fun, and rainy day recess! 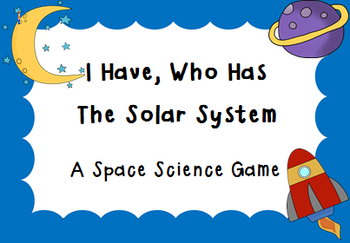 This I Have, Who Has game focuses on the Solar System. There are 24 cards in this game. 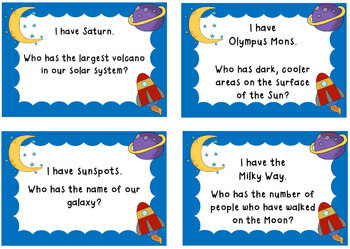 Some of the words used in this game are: Olympus Mons, Milky Way, Ganymede, meteorite, magma, Phobos, Deimos and many more! To play the game, pass out the cards to the students. The student who has the START card will read first. The student who has the answer to the problem will say, "I have ___, who has ___?" The game continues until you reach the END card. My students love to set the timer and try to beat the previous time each time we play!